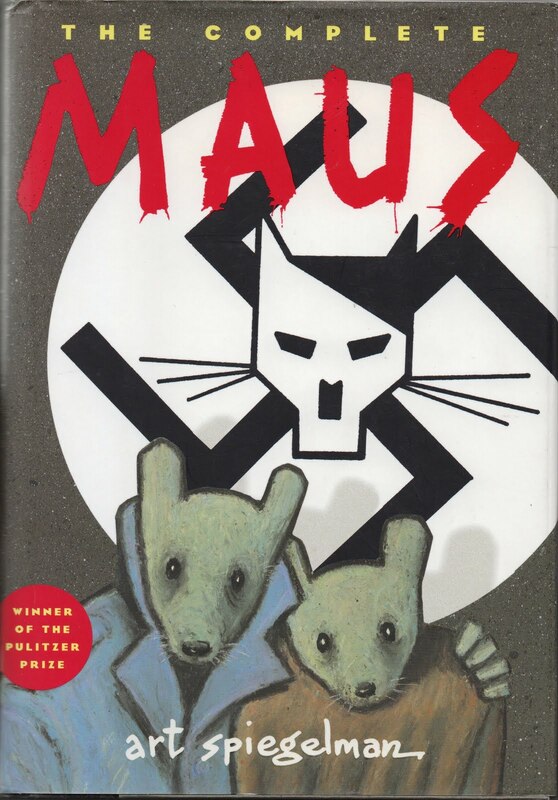 MAUS, Parts I and II, by Art Spiegelman is truly a masterpiece. It’s horrifying, it’s artistic, it’s touching and it’s a true story. Art Spiegelman tells the story of his father, Vladek Spiegelman’s life during the Holocaust while also telling us about his own experiences when he visits his dad. It really shows how Vladek never lost his survival instinct. There’s one scene where Art and Vladek go out for a walk and Vladek picks up a telephone wire that he finds on the street. He doesn’t have any use for it, but he thinks it will be helpful to have. It tells you how this horrible experience made him want to keep everything he finds instead of spending any money. the Poles are pigs, the Americans are dogs, the French are frogs, the Swedes are deer, and of course, the Jews are mice. The art in MAUS is truly beautiful. It also changes as time goes by. In the very beginning there’s lots of detail and shading, but it quickly becomes more simple and flat. The mice’s ears become smaller and they lose their noses. I usually like when characters in graphic novels look different from each other, but in this context the simplicity makes perfect sense. To the Nazis, anyone in stripes would look the same, and to the Jews, anyone in a German uniform looked the same. One thing I really like is the clever idea Art had to put pig masks on the Jews who were trying to pass as Polish. When Nazis catch them they tear off the Jews’ masks. MAUS is definitely not appropriate for the younger audience. There are lots of depressing segments followed by corpses and murder. I myself had a lot of trouble reading it. I would suggest reading it with a parent or a friend. It’s a very touching non-fiction story. I think that its one of the best stories about the Holocaust. I would give MAUS 5 mice out of 5. P.S. there is a book called MetaMaus. It’s sort of like a documentary about Maus. It has outlines of the drawings and pictures of the real people. Thanks Milo, how old do you think someone should be before reading this? I have a nine year old but I'm worried that he might be scared. I too really enjoyed Maus, although I found your own observations much more insightful than my own. Better re-read. I was surprised by and enjoyed the relationship between father and son and how it blended with the father's past. Welcome back and thanks for posting. Great review. I agree with you totally. I wanted to tell everyone about Maus. It blew my mind. Art Speigelman rocks and so do you. Great review of a great comic. I lent Maus to my dad about a year and a half ago and he still hasn't given them back! This is an outrage. Milo - GREAT review, maybe you best one yet! A clear, cogent description and discussion of a complex book and subject. Maus was controversial when it came out, but I think you defended Spiegelman's strategy perfectly. Well done!